Head-drenching spices, jungle treks and leeches - lots of bloodsucking leeches. Nick Vlastuin didn't know what he was in for. While the off-season saw plenty of the usual for the premiership Tiger - sun, surf and a few cold refreshments - things took a turn a fortnight ago. Sumatra was the destination, turning up the heat in 30-plus conditions. But he and fellow flag-winner Jack Graham couldn't have known how tough a time they were in for on the tooth as they went bush with the World Wildlife Fund. "There was tonnes of leeches," Vlastuin revealed. "The hardest part was probably the spice in the food. Jacky Graham, he really struggled with that. "Especially in the ranger station - the closest restaurant is a four-hour four-wheel drive ride away, so you've got no choice. "They kept cooking up chicken and fish, and Jack would ask 'Is this spicy?'. And they'd say, 'Nah, no spice'. Five minutes later, he was sweating bullets. "I struggled a little bit - not as much as Jack. But I had been over there for a month beforehand, surfing in the Mentawai Islands, so I'd kind of gotten used to it then." 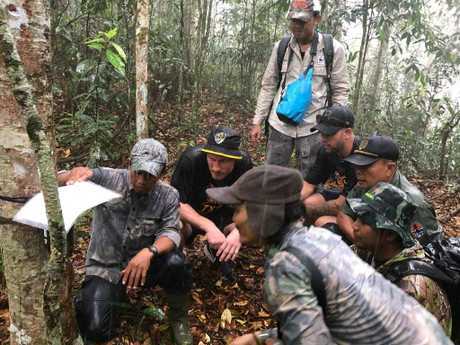 The duo joined the WWF and its Tiger Protection Unit - who looked "big and mean" but loved taking selfies with the players - almost four hours outside Pekanbaru in central Sumatra as part of Richmond's conservation partnership with WWF Australia. 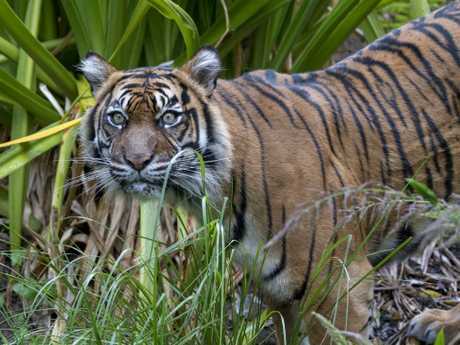 Less than 400 Sumatran tigers remain in the wild, with poaching their greatest threat. The endangered species is also responsible for an average of 10 human deaths per year in the region, meaning while Vlastuin and Graham travelled to the island to learn more about their plight, they weren't exactly all that keen on coming across one while trekking in the jungle. "A week out, we got told we weren't going to see a tiger," he said. "When I told people that, they're like, 'Why would you want to go?'. When we were trekking through the jungle and saw how thick the bush was, there's no made paths at all ... we were like, 'Thank god we're not going to see a tiger'." Vlastuin counted his lucky stars for a simple pleasure when the program started with a homestay at a local village. "I was by myself, and it was interesting," the 24-year-old said. "The two people (I was staying with) were so excited when I walked in, but they couldn't speak a word of English. That was hard. "I was the only homestay that had a shower - everyone else just had a bucket to splash themselves with water, so I was pretty happy with that. "After that came the ranger station, so we caught a boar up the river. The TPU (Tiger Protection Unit) go out on treks in the bush for 14 days at a time. They carry and catch all their food and are looking for snares and check camera traps." He learned that such snares are set up by locals, often looking to catch food, like pigs. "But when they do catch a tiger - which some of them try to do - they will usually kill it themselves because they're worth quite a bit for body parts," he said. "(The WWF representative) was saying to come across a snare with a tiger in it is like a gold nugget for some locals. "The snare is like a 20-30m tree which they pull over, and if you step on the snare, the idea is to lift the tiger up off the ground so it can't get away. They're 150kg and it can fling them up in the air and have them hanging from it. So you can imagine what it would do to a person. It was pretty extreme." Now aware to what is facing the wild tigers, Vlastuin has returned to Australia ready to face the AFL pre-season with a new perspective. Human-tiger conflict in the region was one aspect that took him particularly by surprise. "You kind of know of the problems the tigers are facing - they're getting poached and their habitat is getting destroyed. But I didn't really know any solutions," he said. "The main one was safe work practices for the locals. In the plantations, they often work by themselves. That's when a tiger would attack them. Most tigers that are getting killed are revenge killings. It's an average of 10 (people killed) per year, so then that's 10 tigers that the locals would go and kill. "They're working on creating better work conditions, people aren't getting killed so the tigers aren't, trying to create new jobs so the poachers don't have to do what they do and more efficient farming practices. It's pretty amazing." With searing temperatures and draining humidity, Vlastuin was glad to be rid of his trademark in-season beard - "it would have been pretty disgusting over there" - and will be back to reality on Monday, rejoining his teammates at Punt Rd as summer cranks into gear. "The sleeping routine will struggle, but apart from that, we'll be right," he said. "I'll be used to the heat."